Figs are a rich source of vitamins, minerals, and fiber with many health benefits. Fresh and dried figs have been traditionally used as a natural medicine to treat many ailments, and scientific research backs up many of the health benefits of figs. You can also make a healthy fig tea from infusing fig leaves in hot water. You can use figs to help relieve constipation, improve digestive health, lower blood pressure, and even manage the symptoms of diabetes. You just need to be aware, that figs (especially dried figs) are rich in sugar and have a high glycemic index. Therefore, to enjoy the benefits of figs, it is recommended to eat them along with foods that have low glycemic index, such as walnuts, almonds or vegetables. Eating them together allows the fig (and the sugar) to be absorbed more slowly into the bloodstream. Gram for gram, dried figs also contain more vitamins and minerals than fresh figs. Let’s look in more detail at the important ways that consuming fresh figs, dried figs, fig milk, or fig leaf tea can benefit your health. One excellent way to improve your digestive health is to soak dried figs overnight in some water. 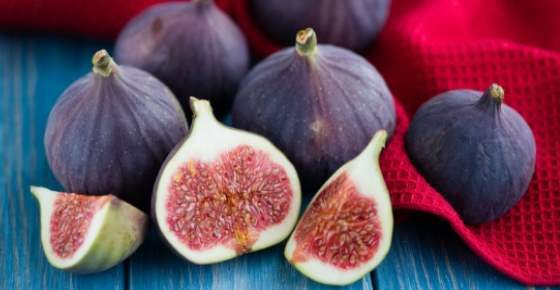 In the morning, eat the fruit and drink the fig water to help get rid of constipation and improve your digestion. Find out other natural laxatives you can use to help get rid of constipation and hardened stools. Regular consumption of fresh or dried figs can help relieve some symptoms of hypertension. Compounds in figs have an effect on the cardiovascular system that helps to lower blood pressure. One study found that extracts from fig leaves can have an anti-hypertensive effect. Scientists observed that a liquid extract of fig leaves significantly reduces blood pressure in rats. (11) At the end of the article, you will find a recipe for fig leaf tea. Learn about other natural remedies that help reduce high blood pressure. Regularly drinking tea made from fig leaves can benefit you if you suffer from diabetes. To make fig leaf tea, simply boil fig leaves in water for at least 15 minutes. You can find out about other foods that help to manage the symptoms of type 2 diabetes. The health benefits of figs also extend to having antibacterial and anti-fungal properties. Learn how to spot the tell-tale signs of a candida infection and how to treat yeast infections naturally. One of the benefits of fig extracts is to create antiparasitic remedies from fig latex. There are other natural ways to get rid of worms, and help to treat tapeworms in humans. Figs contain medicinal compounds that can help keep your liver in good health. Did you know that there are many habits that can damage your liver? Find out how to protect your liver health naturally. Consuming fresh figs regularly is a great way to help promote bone health and help prevent osteoporosis. Why not try some of these non-dairy foods that contain calcium to help strengthen your bones? You can read more about these 4 steps to prevent osteoporosis. The milky sap (latex) of figs contain anti-viral properties, so applying it on warts helps to cure them. Some people apply the milky sap of figs directly to the skin to treat cuts and irritated skin. You can also remove warts using apple cider vinegar (ACV). Dried figs can help to increase hemoglobin levels. Research has shown that certain extracts from the fig plant have anticancer properties. Apart from getting the benefits of figs by eating them fresh or dried, you can create your own fig leaf tea.